Patch for getting Simon's feedback. Adding the pixel test output. Addressing reviewer's comments, updated test baseline. WebKit doesn't lighten the colors when drawing groove/inset/outset borders, so if the color is black (even transparent black), the border appears solid. This differs from Firefox. The patch looks OK but you need to include pixel results. Weird indentation here. Does it contain tabs? Please use 'black', 'green' rather than hex values. Updated patch as per review comments. > The patch looks OK but you need to include pixel results. To generate pixel result should I use "run-webkit-tests --pixel" or the "new-run-webkit-tests --pixel". > Weird indentation here. Does it contain tabs? Please use 'black', 'green' rather than hex values. Ok.will remove the hex values and the tabs. > No need for that. Where are the pixel results for these tests? Also, please keep the filenames all lowercase. You might as well make the border 100px here. Please help committing the patch. This is going to need rebaselining of >500 pixel tests, I'd rather not do it if the change wasn't intentional. I reverted after discussing with Simon in #webkit. Antaryami: I think we need to tweak the patch. Rather than lightening one side and darkening the other (which leaves the two colors two steps apart), I think we should just darken one for light colors, and lighten the other for dark colors. Check Firefox, IE and Opera to see what they do. > Antaryami: I think we need to tweak the patch. Rather than lightening one side and darkening the other (which leaves the two colors two steps apart), I think we should just darken one for light colors, and lighten the other for dark colors. Check Firefox, IE and Opera to see what they do. Yes.I will make necessary changes. I used the border color with solid red to compare it with the color at which borders are drawn when the style is inset. 1. Firefox:- Darken the left and top border, lighten the right and bottom border. 2. Opera:- Darken the left and top border, lighten the right and bottom border . Note:- But the color with which the right and bottom border are drawn are still darker than the one with which corresponding border for firefox are drawn. 3. IE7 :- The IE rendering is completely different form Opera, firefox. > > Antaryami: I think we need to tweak the patch. Rather than lightening one side and darkening the other (which leaves the two colors two steps apart), I think we should just darken one for light colors, and lighten the other for dark colors. I have uploaded a modified patch. Please provide your feedback. Using "baseDarkColor" and "baseLightColor" color to determine whether a color is on darker side or lighter side. For e.g. if the color has a value which is between black and baseDarkColor, then its assumed that it's a darker color. Please note that the values of "baseDarkColor" and "baseLightColor" are set based on some observation and can be modified. Forgot to tick "patch" . Cleared Simon Fraser's review+ from obsolete attachment 108107 [details] so that this bug does not appear in http://webkit.org/pending-commit. This needs ChangeLogs, otherwise looks pretty good. Doesn't this change the pixel results of a lot more tests (like table tests)? When I ran the test without "--pixel", all tests passed. 2. For tests which don't have any expected result currently (31 tests), should I generate a new one? 3. With the new expected result the patch will be significantly big.So how to upload a big patch? Now that chromium port is out, can we check in the patch (The patch was earlier failing for chromium-ews). I will create a patch with latest webkit code base and then upload. Does this patch fix the table rendering issues that the earlier patch broke? Why did you add this here? It's just adding technical debt that someone has to clean up later. Where did these magic numbers come from? > +    Operation operation = (side == BSTop || side == BSLeft) == (style == INSET) ? This line doesn't need to wrap. Would be nice to add a comment justifying this behavior. All CSS1 tests are running OK. Thanks for reviewing the patch. I will comment inline. > Does this patch fix the table rendering issues that the earlier patch broke? From the old messages, it seems that CSS1 was failing. I just attached the output for those tests and all is good. I also tested (fast/css, fast/table, fast/borders) and there are no regressions. > to clean up later. I'm a bit unfamiliar with new tests when they aren't reftests. Should I remove it from TestExpectations? > You can remove this. Coolio, will upload a new patch addressing this. > Where did these magic numbers come from? They came from the original patch, I tried other values but those seems to work better. > > +    Operation operation = (side == BSTop || side == BSLeft) == (style == INSET) ? > This line doesn't need to wrap. All in a single line then? Ok.
> Would be nice to add a comment justifying this behavior. What about '// Here we will darken the border decoration color when needed. This will yield a similar behavior as in FF.' ? 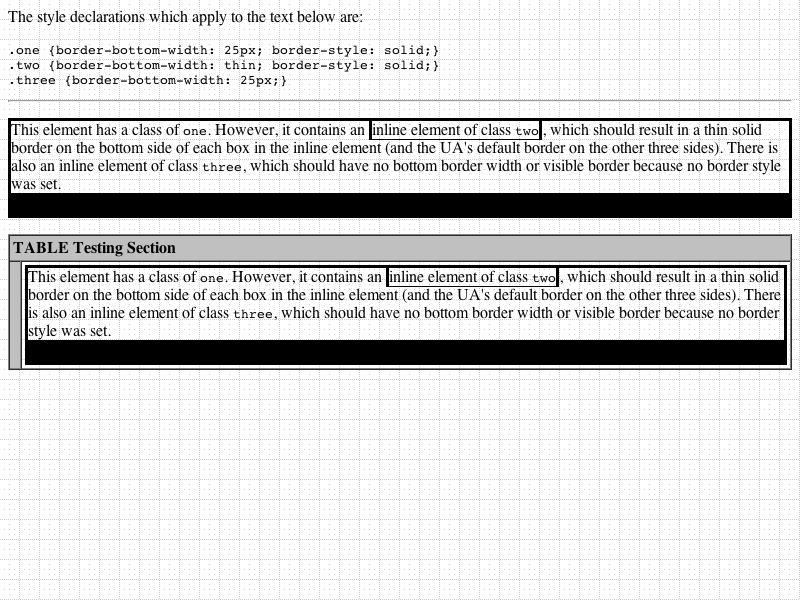 Table layout tests are ok too. It is not obvious from this test what the expected output is. How does someone rebaselining know if the pixel result is correct? Also, could this be made a ref test somehow? I would still like to see a comment that says "derived empirically" or something. This patch added results for mac-mavericks, which also covers mac-mountainlion, please land results for yosemite into platform/mac. An update: image and text results are the same in Yosemite X Mavericks. Previous changeset #176927 had moved the text result.